Halloween is in less than three days! Are you ready? Is your pumpkin all set to be carved? Have you got your candy? When I was a kid my friend’s dad did the most awesome pumpkins. They weren’t actually “carved” – more like etched. I remember him coming to the school and showing us how he did it and being in such awe. He really knew how to carve the pumpkin right, so he didn’t need a pumpkin template or anything. The rest of us, however, definitely need the help of pumpkin carving stencils patterns. Vampires may be what’s “hot” this year, but I’m sort of digging Zombies right now. I saw Zombieland and I’ve been hooked on the flesh eating beasts ever since. There’s a cool site called Zombie Pumpkins that has 213 pumpkin templates – all you need is a printer, a pumpkin, and carving tools. Just dig through the Gruesome Gallery and you’ll witness thousands of chilling creations from carvers of all ages and experience levels. Need help with the actual act of carving? Check out Pumpkin Carving 101 – a step by step photo-tutorial on how to successfully use a jack o’ lantern template to carve a great pumpkin. If you’re looking for more light-hearted pumpkin carving fun, Family Fun has the pumpkin carving stencils patterns you want. Being tossed around by the Headless Horseman can lead to some serious bumps and bruises! A few strips of reflective tape help this petrified pumpkin look a little more pieced together — and create a cool glow when trick-or-treaters’ flashlights or the headlights of passing cars shine on them. These frightened pals are enduring some unwelcome midnight callers. 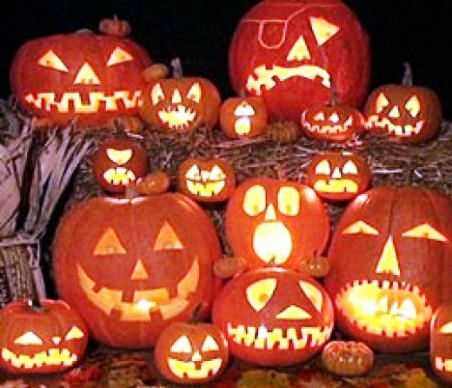 While plastic spiders skitter-scatter over one, a mouthful of slithering snakes gives the other eyes as large as, well, pumpkins. No need to be an expert carver. This clever front-yard decoration gets its good looks from simple, easy-to-find props. An old shirt, glove, and wire coat hanger help this hungry fellow devour his skewer of horror d’oeuvres.